Ezilda Anna Norton was born on 27 January 1828 at Sacketts Harbor, Jefferson Co., NY. She was the daughter of Harvey Norton and Frances Marian Austin. Ezilda Anna Norton died on 24 March 1913 at Port Townsend, Jefferson Co., WA, at age 85. She was buried at Fall City, King Co., WA. Eleanor J. Norton was born on 29 June 1826 at Jefferson Co., NY. She was the daughter of Harvey Norton and Frances Marian Austin. Phylinda M. Norton was born on 14 December 1823 at Jefferson Co., NY. She was the daughter of Harvey Norton and Frances Marian Austin. Phylinda M. Norton died on 16 August 1871 at Greenwood Co., KS, at age 47. Benjamin Franklin Norton died at OR. He was born on 8 September 1822 at NY. He was the son of Harvey Norton and Frances Marian Austin. Emma A. Norton was born on 18 December 1831 at Sacketts Harbor, Jefferson Co., NY. She was the daughter of Harvey Norton and Frances Marian Austin. Emma A. Norton died on 23 June 1910 at Sapulpa, Creek Co., OK, at age 78. She was buried at Hallowell, Cherokee Co., KS. Eunice J. Norton was born on 29 December 1833 at Sacketts Harbor, Jefferson Co., NY. She was the daughter of Harvey Norton and Frances Marian Austin. Eunice J. Norton died on 27 August 1914 at Port Townsend, Jefferson Co., WA, at age 80. She was buried on 28 August 1914 at Port Townsend, Jefferson Co., WA. Frances Marian Norton was born on 29 July 1844 at Des Moines, Polk Co., IA. She was the daughter of Harvey Norton and Frances Marian Austin. Frances Marian Norton married Horatio Pritchard. Frances Marian Norton died on 5 February 1909 at Madison, Greenwood Co., KS, at age 64. She was buried on 7 February 1909 at Madison, Greenwood Co., KS. Lucy Hillyer was born on 7 April 1736. She was the daughter of Capt. James Hillyer and Mary Eno Humphrey. 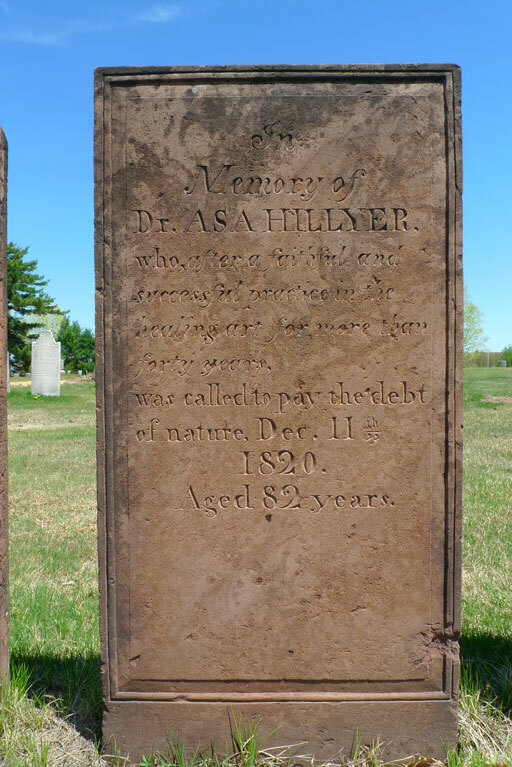 Asa Hillyer was born on 21 August 1738 at Simsbury, Hartford Co., CT.1 He was the son of Capt. James Hillyer and Mary Eno Humphrey. Asa Hillyer married Rhoda Smith in 1760 at Simsbury, Hartford Co., CT.1 Asa Hillyer died on 11 December 1820 at East Granby, Hartford Co., CT, at age 821, and was buried at Center Cemetery, Granby, Hartford Co., CT.
Andrew Hillyer was born on 4 June 1743. He was the son of Capt. James Hillyer and Mary Eno Humphrey. Pliny Hillyer was born on 12 May 1748. He was the son of Capt. James Hillyer and Mary Eno Humphrey. 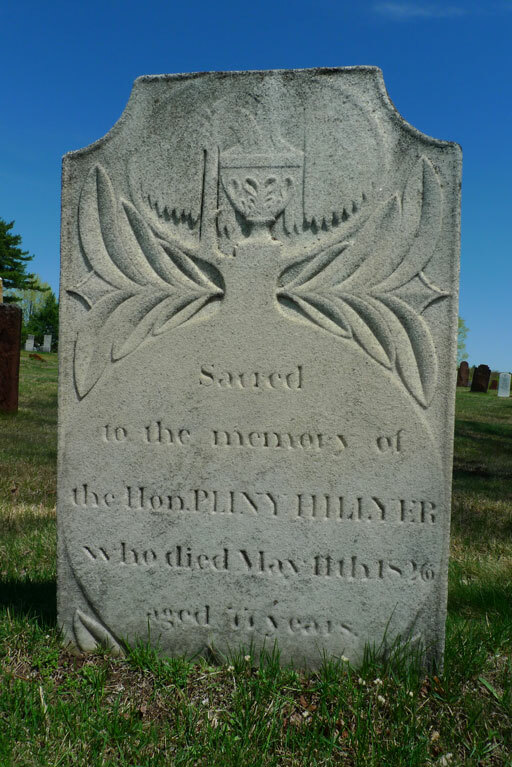 Pliny Hillyer died on 11 May 1826 at age 77, and was buried at Center Cemetery, Granby, Hartford Co., CT.
Affiah Hillyer was born on 2 February 1752. Affiah Hillyer was the child of Capt. James Hillyer and Mary Eno Humphrey. Elizabeth Humphrey was born on 9 July 1717. She was the daughter of Ensign Samuel Humphrey and Lydia North. Elizabeth Humphrey married Joseph Wilcox, son of Joseph Wilcox and Abigail Thrall, on 27 October 1735 at Simsbury, Hartford Co., CT.
[S275] Frederick Humphreys, Humphreys, Vol. I, Page 255. Joseph Wilcox was born in 1706. He was the son of Joseph Wilcox and Abigail Thrall. Joseph Wilcox married Elizabeth Humphrey, daughter of Ensign Samuel Humphrey and Lydia North, on 27 October 1735 at Simsbury, Hartford Co., CT. Joseph Wilcox died in 1759. Isaac Humphrey was the son of Ensign Samuel Humphrey and Lydia North.1 Isaac Humphrey died on 3 August 1732. Benjamin F. Austin was born on 30 May 1803 at Redfield, Oswego Co., NY. He was the son of Benjamin F. Austin and Jerushia Mather. Benjamin F. Austin married Lois Louise Baxter on 8 November 1825 at Lockport, NY. Benjamin F. Austin died on 25 May 1877 at Shenandoah, Page Co., IA, at age 73. Caroline Pattison was born in 1871. She was the daughter of Joseph Pattison and Delia Sceery. Caroline Pattison married Edward McChesney Eddy, son of John C. Eddy and Ida McChesney, on 18 September 1899. Caroline Pattison died in 1954. Edward McChesney Eddy was born on 3 January 1879 at Brunswick, NJ. He was the son of John C. Eddy and Ida McChesney. Edward McChesney Eddy married Caroline Pattison, daughter of Joseph Pattison and Delia Sceery, on 18 September 1899. Edward McChesney Eddy died on 31 March 1939 at Hartford, Hartford Co., CT, at age 60. Edward was recorded in the 1920 Simsbury census, age 18, in the household of his parents. [S182] Social Security Death Index (on-line), Ancestry.com, SSDI, Ancestry.com, SSAN 045-07-5242. Alberta Emma Messenger was born on 4 December 1905. She was the daughter of Grover C. Messenger and Lilla S. Vining. Alberta Emma Messenger married Edward McChesney Eddy Jr., son of Edward McChesney Eddy and Caroline Pattison, on 25 June 1927. Alberta Emma Messenger died on 22 July 1992 at Hartford, Hartford Co., CT, at age 86. Alberta was recorded in the 1920 Simsbury census, age 14 in the household of her parents. Grover C. Messenger was born on 25 April 1884. He was the son of Francis Eugene Messenger and Emma Latimer. Grover C. Messenger married Lilla S. Vining. Grover C. Messenger died on 5 September 1966 at Simsbury, Hartford Co., CT, at age 82. Lilla S. Vining was born on 31 July 1886 at Rockville, CT. She married Grover C. Messenger, son of Francis Eugene Messenger and Emma Latimer. Lilla S. Vining died on 25 September 1962 at Hartford, Hartford Co., CT, at age 76. Francis Eugene Messenger was born in October 1846 at CT.1 He married Emma Latimer. Francis and Emma were enumerated in the 1900 Canton, Hartford Co., CT, federal census. He was a farmer, age 53, she was 49. Children in the household were Grover 16, Nella 13, Wilburt A. 11, and Miles W. 8. Emma Latimer was born in November 1850 at CT.1 She married Francis Eugene Messenger. Alexander Pattison was born in 1861. He was the son of Joseph Pattison and Delia Sceery. Alexander Pattison died in 1931. Soon after his birth, Benjamin's parents moved to Ontario County, NY. His widowed mother and a portion of the family, including Benjamin, removed to Ohio. After living, for short periods, near Franklin, at Worthington, and at Orange, Delaware County, he settled, in 1817, in Goshen township, Ohio. After Aminda died, he brought his children to their mother's relatives in Delaware County. [S275] Frederick Humphreys, Humphreys, Vol. II, Page 423. [S312] Virginia Mccormick, Scioto Company Descendants, Page 141. Robert McMaster died at Ontario Co., NY. [S275] Frederick Humphreys, Humphreys, Vol. II, Page 577. [S275] Frederick Humphreys, Humphreys, Vol. II, Page 424. [S275] Frederick Humphreys, Humphreys, page 424. [S275] Frederick Humphreys, Humphreys, Vol. II, Page 580. [S312] Virginia Mccormick, Scioto Company Descendants, Page 142. [S312] Virginia Mccormick, Scioto Company Descendants, Page 143. Lurenda Humphrey was born on 4 September 1801 at West Simsbury, Hartford Co., CT.1 She was the daughter of Lemuel Gordon Humphrey and Dorcas Case.1 Lurenda Humphrey married Agamemnon Plumb on 31 December 1820 at Delaware Co., OH.2 Lurenda Humphrey married Stephen Maynard, son of Stephen Maynard and Elizabeth Wright, on 28 March 1832 at Delaware Co., OH.2 Lurenda Humphrey died on 31 August 1872 at Tipton, Cedar Co., IA, at age 70. Lurenda went with her parents to Ohio in 1807. She and Agamemnon had no children. Stephen moved with his parents to near Worthington, Franklin Co., O., in 1806. In 1844, they went from thence to Johnson County, near Iowa City, Iowa; and, in 1860, to Tipton, Cedar Co., Iowa. Stephen was possessed of scholarly tastes, a love of books, and a remarkable memory, "and his mind was a remarkable store of knowledge. He had a strong vein of humor which made his conversation interesting to both young and old. He was a thoroughly conscientious man; --'So long as he lived he strove to live worthily.'" Lurenda was noted for her active benevolence. Her heart went out in lively sympathy for all who were in any trouble, and many an orphan found shelter and motherly care in her home. Both Lurenda and Stephen were from youth devout members of the Protestant Episcopal Church, lived blameless lives, were honored members of society, and died in the hope of a glorious immortality. [S275] Frederick Humphreys, Humphreys, Vol. II, Page 425. [S275] Frederick Humphreys, Humphreys, Vol. II, Page 426. Thomas' parents died in his childhood and he was brought up by his uncle James Willington Hall, residing for a time near Lake Champlain. He removed to Onondaga County, N.Y., in 1812, and afterward to Worthington, O; finally settled, in 1830, on a new farm in Liberty township, Delaware Co., O., and engaged in brick-making. In politics, he belonged to the whig party; was the first Secretary of the Delaware County Temperance Society, organized about 1835, and for a long time continued to fill that position. He was an early and earnest advocate of free schools, and for many years a devoted officer and worker in the church and Sabbath-School of the Methodist Episcopal communion. He united with the church about 1840. [S312] Virginia Mccormick, Scioto Company Descendants, Page 144. [S275] Frederick Humphreys, Humphreys, page 427. [S312] Virginia Mccormick, Scioto Company Descendants, pagae 144. [S275] Frederick Humphreys, Humphreys, Vol. II, Page 427. [S275] Frederick Humphreys, Humphreys, Vol. II, Page 428. [S275] Frederick Humphreys, Humphreys, Vol. II, Page 429. [S312] Virginia Mccormick, Scioto Company Descendants, Page 145. Sarah Humphrey was born on 10 September 1813 at Liberty, Delaware Co., OH.1 She was the daughter of Lemuel Gordon Humphrey and Dorcas Case.1 Sarah Humphrey married John Wilson, son of John Wilson and Mary Cox, on 1 January 1834. John was a stone-cutter by trade; but on account of his health engaged in agricultural pursuits. In the fall of 1842, he removed with his family to Iowa, in company with his brothers-in-law, Lemuel and Rev. Aaron Case Humphrey, and settled in Johnson County, where he became a large and successful farmer and nurseryman. In the fall of 1868, he and his wife removed to their present home (1883) in Iowa City, Iowa. Mr. and Mrs. Wilson have always and everywhere been known as earnest and active friends of temperance, education, and every interest of the best Christian civilization. They have been for many years worthy members of the Methodist Episcopal Church, the power and influence of which communion in the State of Iowa owes not a little to their fidelity and devotion. The completion of the year 1883 will bring them to the fiftieth anniversary of their marriage, with their entire family of eight children arrived at maturity, and honoring by their character, culture, and influence, their parents' exalted example and standards of worth; --the use of either spirituous drinks or tobacco being unknown in the family, and all being in the membership of the Methodist Episcopal Church. --Frederick Humphreys. [S275] Frederick Humphreys, Humphreys, Vol. II, Page 430. [S275] Frederick Humphreys, Humphreys, Vol. II, Page 431. 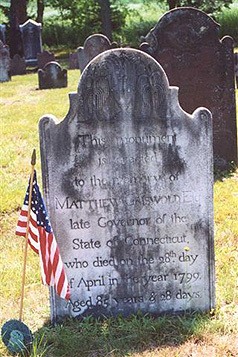 Matthew Griswold was born on 25 March 1714 at Lyme, New London Co., CT.1 He was the son of John Griswold and Hannah Lee. Matthew Griswold married Ursula Wolcott, daughter of Gov. Roger Wolcott and Sarah Drake, on 10 November 1743 at Lyme, New London Co., CT. Matthew Griswold died on 28 April 1799 at age 85. He was buried at Duck River Cemetery, Old Lyme, New London Co., CT.
[S116] Esther Griswold French and Robert Lewis French, Griswold, Page 196, Item 18. Gov. Roger Griswold was born on 21 May 1762. He was the son of Matthew Griswold and Ursula Wolcott. Gov. Roger Griswold married Fanny Rogers, daughter of Capt. Zabdiel Rogers and Elizabeth Tracy, on 27 October 1788 at Lyme, New London Co., CT. Gov. Roger Griswold died on 25 October 1812 at age 50. [S116] Esther Griswold French and Robert Lewis French, Griswold, Page 213, Item 43.